This Friday January 19 2007, the 690 Congolese provincial deputies voted for the senators who will occupy 108 seats all over the DRC, out of a total of 1,127 candidates. There were four seats allocated for each of the 25 provincial constituencies, with the remaining 8 seats allocated to the city province of Kinshasa. Voting in general proceeded well all over the country, where a majority of deputies were required to be present to vote in the senators for each district. 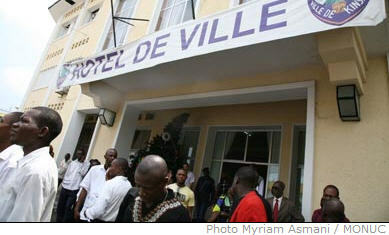 In Kinshasa, however, proceedings were disrupted when a group of local journalists who had arrived late forced their way into the voting room in the Town Hall, causing the elections to be temporarily suspended. The provisional results are now in the process of being compiled, and will be ready for publication tomorrow Saturday January 20 by the Independent Electoral Commission (IEC). According to the electoral calendar published by the IEC, the new Senate is then expected to install themselves on Saturday February 3 2007, with each senator having a five year renewable mandate. The next DRC elections are for the governors and vice governors, with the first round due to take place on January 27 2007.